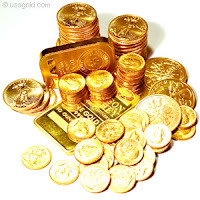 Business Attitude: Where Gold is Going and Why is this "Up or Down" So Different. Where Gold is Going and Why is this "Up or Down" So Different. Everyone needs to do a little research on some basic economic principles because our next economy is going to be very unique - unique in that what could occur will be unique, not only to my life, but in modern history. What I think the future brings us in the next 10 years. Higher Interest Rates (duh). Yea, yea, but try to remember the 80s where good mortgage rates were 13% - 16% (think about what that would do to your monthly mortgage payment). Prime rates exceeded 20% (21.5% on December 19, 1980). So what will cause rates to go up? Demand for capital and inflation. Higher Inflation. No one likes to talk about this one much but there is definitely the buzz of borrow today (or yesterday) and pay back at and with tomorrow's dollars. Can our government (the controllers of our M1) do anything else? With a 100% inflation over a 10 year period (this is not a lot nor hyper) paying back the national debt will be only half as costly. Think about that... and then consider that inflation could be as high as 250% in the next 10 years. Back in 1980 inflation went as high at 14.7%; 1980 was a very interesting year.! It takes only 7.2% inflation to double the cost of living in 10 years (rule of 72). In a time of record corporate profits and stagnate wages, we can expect our wages to increase because of new and higher demand for labor and profit potential from that labor. Corporate profits will, likely change hands and most likely drop from their current levels - but not much. What does this mean? Stocks are not necessarily the best investment. Corporate balance sheets will also change from very high cash positions to lower, more normal, positions. Unemployment can only go one direction and that is down. This drop in unemployment will be a part of the fuel to drive inflation (again, remember the 80s and Reagen's 84 classic speech repeating what he said in 1980, "are you better off now or then you were 4 years ago". In addition, there is a "feel good" to big raises even if they are only to keep up with inflation. National debt is, like said above. The government will address this with tomorrow's less valuable dollar rather than today's more expensive dollar. The title of this article is "Where Gold is Going and Why is this "Up or Down" So Different". So where do you think it will be in 10 years? A better question to ask is why (based on the information above) is the price dropping over the last several months. My prediction: $8K to $10K per ounce before 2020. Hmmm, consider contra-investing.! and ask why some pros are buying. Personal Disclosure: I have no positions in any stocks mentioned, and no plans to initiate any positions within the next 30 days. I wrote this article myself, and it expresses my own opinions. I am not receiving compensation for it.